This is the film that Lucio Fulci did along with The Sweet House Of Horrors for the “Doomed Houses” series of TV movies in Italy that also consisted of House of Lost Souls and House of Witchcraft from Umberto Lenzi. 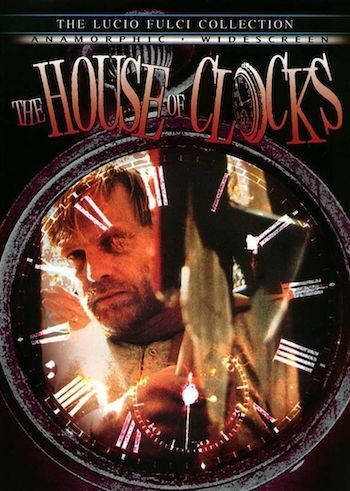 The House of Clocks is less painful to sit through the The Sweet House of Horrors, but that doesn’t alter the fact that The House of Clocks is typical of late period Fulci TV fare where production values, acting, and story all compete to see which is the shoddiest. And guess what? They’re all winners! A housekeeper discovers the bodies of a couple of people in a locked room. The room is a chapel and the two people are laid out in coffins like they’re ready for viewing, except their faces are kind of messed up and they both have railroad spikes sticking out of their necks! These two turn out to have been the niece and nephew of the kindly old couple that owns the house. These old people are poster children for why nursing homes should be locked down facilities. Old Man is the kind of distinguished chap who dotes on his cat so much that he kills birds for it and then dumps the bird on the floor so the cat can eat it. Old Lady is the kind of grandmotherly sort who works in her garden and has a pike laying around just in case she needs to impale the snoopy and disagreeable housekeeper. 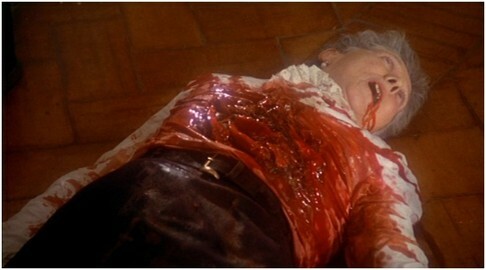 The housekeeper gets stabbed and we get a good lingering look at her guts dumping out of the hole in her stomach. Luckily, Old Lady has a one-eyed handyman on staff to dig a grave for her. We also find out that Old Man and Old Lady killed their niece and nephew because they were after their house. Just so we don’t think these oldsters are complete villains they do maintain a rather extensive picture collection of their deceased niece and nephew. Even though all the nonsense involving the old timers, their gutted housekeeper, dead relatives, and vision-impaired help would be more than enough to make up a really loaded horror film, it was merely all prologue! Three punks decide to rob these old people. Why? Who knows? For some reason though, it involves them making a long drive, so I can only guess it’s because they’ve already robbed everyone in their own neighborhood. Their trip to the old timers’ house is uneventful except for the discovery that a cat has stowed away with them in their car. For some reason one of them puts the cat in a plastic bag and leaves it laying on the floor to suffocate. Once they arrive at the house, the girl pretends she has car trouble (“I think there’s a cat stuck in my alternator”) and that’s when her two pals bust in to steal some valuable stuff, like all these clocks that Old Man collects. There’s a problem when One Eye shows up with a shotgun and the next thing you know, One Eye gets conked on the head, Old Lady gets blasted in the chest and Old Man gets killed as well. This is about the time the scariest part of the movie happens! Just when it seems like the movie is half done, all the clocks and watches in the movie start spinning backwards! For a movie where you’re constantly pleading for it to go faster, the last thing you’re wanting to see is time going in reverse! As time goes backwards the oldsters come back to life, the niece and nephew come back to life and even the housekeeper gets another run when she pops out of her grave. At first all this time travel seems to benefit Old Man and Old Lady since this means they can get revenge on these three dirt bags, but when Niece and Nephew get revived it turns out that they are still holding a grudge for getting spikes pounded into their throats.! Eventually we are back in the car with the girl and it turns out that she was just dreaming all of this and so were her two boyfriends and they decide that it wouldn’t be a good idea to rob the house after all. Perhaps fittingly, the movie’s finale is left up to the cat in the plastic bag. The movie is completely forgettable and a moderately tedious excuse for some gore scenes, but the Shriek Show DVD has a couple of interviews from the cast of interest. During one of them, Old Man babbles incoherently about how he broke a rib in one scene. The real showstopper though is the interview with the housekeeper. She spends close to ten minutes complaining bitterly about how she had to lay in a box underground for a half hour when she was buried in her grave and once she was done no one told her how tough and brave she was for doing it. Come on lady, it’s not like you were a cat in a plastic bag or anything.